In The 37s, the crew of Voyager meet Amelia Earhart. Really. Turns out that she, and several other humans, had been abducted by aliens, and taken to the Delta quadrant to work as slaves. The descendants of these people had established a colony on this world, and apparently lived in some remarkable, magnificent, fabulous cities. It's difficult to be sure about this, as we never actually *see* any of these cities, but they are wonderful enough that Janeway decides to allow any of the crew who wants to, to leave Voyager and settle on this world. To stay on the planet they had to report to a cargo bay, and on the way to the cargo bay to see who will be staying on the planet, Janeway and Chakotay talk about which of the crew may choose to stay behind. Just before opening the doors, Chakotay puts his hand on Janeway's shoulder, obviously to support her, and then opens the door. We see Janeway near tears, and an empty cargo bay. They both smile at each other, glad to know that their little family will not be broken up. Back on the bridge a very happy Janeway orders Paris to resume course for home. On Stardate: 48921.3 Voyager encouters a cloud of space-dwelling beings which are attracted to the ship. Kes becomes sick, and we learn that the lifeforms accelerate Kes' reproductive process. Chakotay deduces that the beings are sexually attracted to the ship. They find a way to get themselves out of trouble by pretending to be a rival of the being in charge. We can play Pervert that Line again, when Janeway tells Chakotay that the next time she has a question about mating behaviour, she'll turn to him. But the course of true love hardly ever runs smooth. Every so often, Janeway and Chakotay disagree about how to run the ship, how to deal with the crew, or how to deal with the alien civilizations they come in contact with. These disagreements seem to boil down to the fact that Janeway believes in following Starfleet rules, even though they are a long way from the Federation, while Chakotay believes that some rules have to be sacrificed if they are to survive in the Delta quadrant. 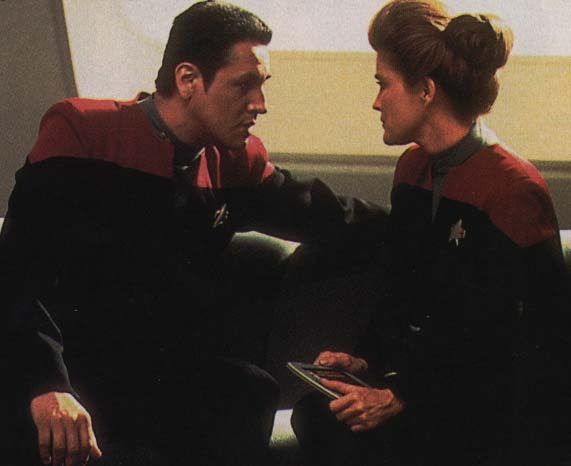 In the episode Alliances, Chakotay finally convinces Janeway to make a strategic alliance with the Kazon, who had been Voyager's greatest enemies almost from the moment they arrived in the Delta quadrant. In this episode, Janeway and Chakotay are infected by a fatal virus. It is only the properties of an alien moon that keeps them healthy and alive, and so Voyager is forced to abandon them on the moon. They are left with plenty of supplies and they begin an entirely new life in their new home, on a world they call New Earth. In fact, one of the first things Janeway does is tell Chakotay that he no longer needs to call her Captain, and he calls her Kathryn for the first time in our knowledge. While Janeway is at first absorbed with finding a cure to their illness, Chakotay tries to make their new home as comfortable as possible. He builds Janeway an outdoor tub, headboards for the beds, and even designs a boat so that they can explore the river. Although nearly all the scenes on New Earth are JetC material, a few stand out. There is the time that Janeway is soaking in the tub while Chakotay is in the house. She is startled by a noise and he rushes out to see what the trouble is, only to find Janeway standing there wearing nothing more than a towel. :-) He spends a few moments staring at her, before he awkwardly retreats back to the house. Later on a freak storm destroys nearly all of Janeway's experiments, and she finally is forced to let go of Voyager and accept life on New Earth. The work of clearing up after the storm leaves her with sore muscles, and Chakotay tries to ease her soreness by massaging her neck. It starts off innocently enough, but soon they both realise that something more is going on, and once again Chakotay retreats. That night Janeway forces the issue, telling him that they "need to discuss this." Chakotay responds by telling her "an ancient legend" of his people, the legend of the angry warrior, and how he found peace by joining with the woman leader of a neighbouring tribe. Not surprisingly, the crew of Voyager defy Janeway's orders, manage to get a cure for the disease, and return to New Earth to reclaim their Captain and First Officer. But not before we are treated to a sight of Janeway and Chakotay living in domestic harmony, extremely comfortable in each other's company. This makes their return to the ship all the harder to bear, as they are forced once again to become "Captain and Commander" instead of simply "Kathryn and Chakotay".